Pioneers experienced extraordinary hardships and rewards making a life for themselves and their families in the Western frontier with no towns or amenities. In this exhibit, learn about the strength and courage of the early settlers who faced danger, starvation, privation, and loneliness in order to create a new life in the early West. Early pioneers showed amazing resourcefulness and ingenuity to create a new life out of nothing. Explore the importance of community in the new frontier settlements. Pioneers had to rely on each other to survive which made the bond between them strong, thus making the community strong. Who were the first settlers to come to the Yampa Valley? Where and how did they live? Discover stories of isolation, harsh winters, dangers, opportunity and freedom. What was life like for the first settlers and why did they make the journey west? Why would you need to set up a tent inside your sod roof home in during the spring? The Woolery family did due to the snow melt. At first they all sat under the kitchen table, but that was too cramped so Mrs. Woolery set up a tent inside. Why did people seeking relief from respiratory illness come here? What were the first steps to securing a homestead under the Homestead Act? How do you survive winter with small children, no general stores or supplies and the closest neighbor was a three to five mile walk/snowshoe away? How dangerous was the high water in the spring without bridges? What did it take to be a homesteader? What were the requirements of the Homestead Act of 1862? Who were the first to come and where did they come from? What was life like for the first settlers and why did they make the journey west? How did the railroad impact the settlement of the region? 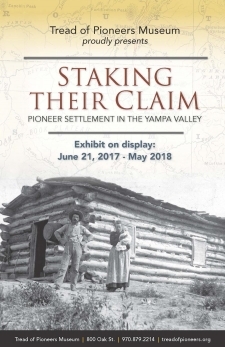 Through pioneer stories, recollections, and historic photographs, the Tread of Pioneers Museum�s newest exhibit, �Staking Their Claim,� tells the story of pioneer settlement in the Yampa Valley. The exhibit features sound clips from oral history interviews with early settlers, film segments detailing the rules of the Homestead Act of 1862, and fascinating pioneer artifacts from the museum�s collection. 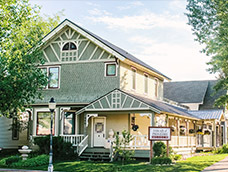 The exhibit pieces together the stories of hardship and success of making a home and a living in one of the last regions settled in the rugged Rocky Mountain West. Come discover the stories of isolation, dangers, opportunity, and freedom.